Allow me to preface by telling you that I don’t consider myself to be suffering from chronic slothfulness. In fact, I would say that my willpower levels are at a rather satisfactory level these days. The reason I selected this book was more about fine-tuning than it was for a major personal transformation. 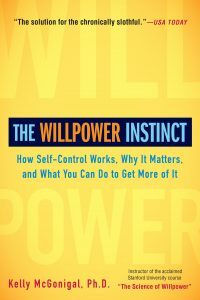 However, I think this book is great regardless of whether you want a total willpower makeover, or you’re simply looking to optimize your routines for a little more effectiveness. I really love the scientific approach taken by the author. I’m often hooked when a book begins to describe the physiological side of human behavior. This is one of the fascinating things about the time in which we live. Technological advancements have given physicians unprecedented looks at what the brain does when this or that is happening. If you’re a little familiar with the brain, you might have guessed that there’s a great deal of focus on the frontal lobe. Specifically, that beloved little section called the prefrontal cortex. As one who has studied the brain, psychology, and the so-called science of happiness, there were certainly some familiar concepts discussed in this book. However, I am quite pleased with that, because I know that hearing the same thing from multiple sources has a number of benefits. For one thing, it gives me a sense that it is reliable information. Also, it serves to strengthen the neural pathways in my brain where that information is stored and related to my personal experiences. So, rather than only remembering the information when somebody else brings it up, I’ll be reminded of the info more easily, and it will be readily available to serve me in my day-to-day life. Some of my biggest take-aways from this fantastic book. Start Small – If you’re struggling to lose weight, as little as 5 minutes per day of walking can snowball into a life-changing routine. Meditation For All – You don’t have to be a guru to reap the benefits of meditation. The very act of being lousy at medication yields positive results! If you meditate for 10 minutes, and feel like you spent the whole time repeatedly shifting your focus from mind chatter back to the breath, your brain (vis-à-vis, you) still benefitted! Think of it as curling dumb bells with your “mental muscle.” You wouldn’t expect to curl 50lbs your first time in the gym, and you shouldn’t have similarly unrealistic standards for your brain either. Just meditate! Heart Rate Variability – This was a new concept for me, and I found it rather intuitive. The author says that heart rate variability is a very reliable indicator of your “Pause and Plan” response. The pause and plan response is what happens when we avoid the trap of making decisions compulsively. The idea is that your heart rate is fluctuating with every single breath. You breathe in, and it speeds up as you get a fresh load of oxygen, then you breathe out, and the heart rate slows and you feel a little tiny dose of relaxation. That is… unless you’re stressed! If you don’t take control of your mind, you are robbing yourself of the P&P response and its myriad benefits. One easy way to nurture your P&P response is to simply slow down your breathing when you’re faced with a willpower challenge. I will, I won’t, and I want – This was a very powerful takeaway for me. I love the simple framework for applying self control to your goals and aspirations. I’ve spent a good amount of time thinking about what’s important in my life, and where I want it to lead. I’m excited about taking a fresh look at my aspirations through the lens of this conceptual triad. Of course, Group A, upon hearing these very biased phrases became very indignant. Group B, upon hearing the less offensive phrases didn’t have much of a reaction. Both groups then began the experiment. They were to screen candidates for an engineering job, and make hiring decisions. The results were astounding. Group A, the morally indignant group was MORE likely to discriminate against women during the hiring experiment. It’s as though their brains considered the very act of getting offended by the statements to be a “good deed” and their brain let them off the hook when it actually mattered. I learned that it’s very important to avoid the trap of assigning “good” and “evil” to choices I make along the path of pursuing my goals. When I review my progress, I’ll ask myself “how committed have I been?” rather than “How good or how bad have I been?” Silly little changes in phrasing like this can have profound effects on how the brain responds. Be Mindful – Certainly not a new concept, but mindfulness really ties it all together. Give your brain a break once in a while, so it will be at its best when you need it the most. Don’t underestimate the power of phrasing when thinking to yourself or talking to others. Don’t let your emotions rule your life. Don’t let your flawed brain be the boss of you. It’s a tool. It’s an incredible tool, and it’s yours to wield! It’s yours to nurture. It’s yours to improve. This is my first post. I’m going to intentionally leave the title as “Hello world!” and see how that goes. 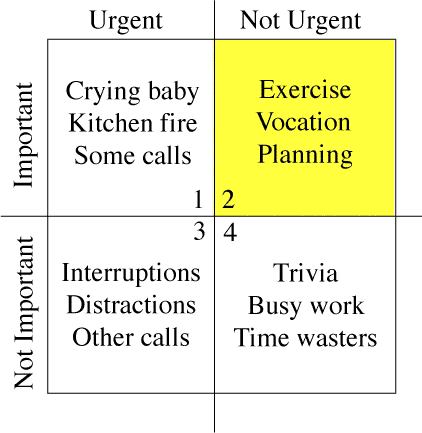 In case you’re not familiar, quadrant two refers to Covey’s time management matrix, which is explained rather well in this article. Friday has become special to me in a new way recently. It’s become a day of reflection. As the aging and busy brain buzzes along, there aren’t a ton of extra resources to devote to documenting my biography mentally. (Read: I can’t remember a damn thing!) I’m not really a journal writer, but I love the idea of keeping a record of what happens in my life. I’m excited about this website, which of course will serve as a tool for documenting my biography in a much more reliable way than just hoping I remember stuff. I’ve learned that except for in rare cases, the human brain isn’t really all that good at remembering the innumerable details of our lives – at least not ACCURATELY. The brain is more of a tool for predicting the future based on what it deems the most important bits and pieces of past experiences. Unless you’re one of those rare humans with an eidetic or photographic memory, there are much more appropriate tools for remembering things exactly as they were. 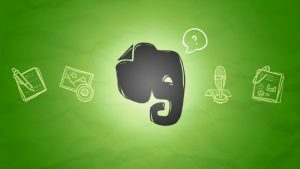 Evernote – ideas, SOP’s, checklists, and other documentation can be stored in evernote quite easily. They are then accessible from any of my computers or mobile devices. I can even share folders with my team and collaborate on notes. Facebook – photos, videos, commentary, and just about any other relevant or completely irrelevant thing you can think of. I started using facebook heavily to share photos of my kids growing up with my Mom and other family members out of state. It’s a bit of a pain to go back and find a specific memory, but it has definitely become a substantial tome containing thousands and thousands of mementos from the past 10 years of my life. Youtube – admittedly, I have not been as active this year as I have in the past, but posting videos and setting them to “unlisted” allows me to share them with my family via email, without them coming up in search results and being viewed by the rest of the world. To me, videos are much more intimate than photos, and I typically don’t wish to share home videos with every single person on my facebook friends list. I’m sure they appreciate that. It has become a New Year’s Eve tradition to watch home movies in our youtube year in review. This blog – I plan to use this website as a central place for sharing and compiling my reflections, expressions, ideas, and ramblings.